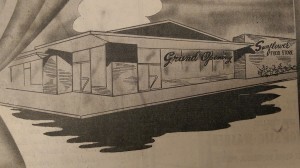 The “modernistic” Sunflower Grocery, designed by Harold Kaplan, opened in 1959 in Greenville. “White Pillars” is a Neoclassical Colonial home designed in 1948 for the Nash family by Harold Kaplan. The traditional architecture is in contrast to many of Kaplan’s Modernist public architecture. 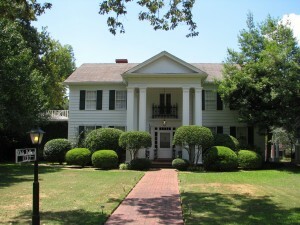 Lakeport Plantation’s monthly history talk, Lakeport Legacies, will feature Jennifer Baughn, chief architectural historian at the Mississippi Department of Archives & History. Mrs. Baughn, in her talk titled, “Delta Modern,” will discuss Mid-Century architecture (1930s-1960s) in the Mississippi Delta. At Mid-Century, traditional and modern styles were competing architectural visions. In the Delta, the period is exemplified by two architects: Leland native Harold Kaplan and Jackson’s N. W. Overstrett. Kaplan’s Modern designs for public buildings, like T. L. Weston High School (1954), are a contrast to his designs for traditional Colonial private homes, like White Pillars (1948) in Greenville’s Gamyn Park neighborhood. Drawing from examples across the Delta, Baughn will discuss the region’s most interesting Modern architecture such as Greenville’s Coleman High School and Delta State’s Young-Mauldin Cafeteria. Exemplifying the optimism and booming economy of the decades after World War II, Mississippi’s Modernist architecture is gaining the appreciation of both historians and architecture buffs for its clean lines, functional planning, and futuristic detailing.